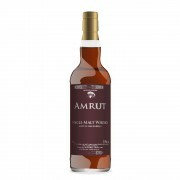 If I were to buy a standard bottle of Amrut Fusion now, I would guess that it would taste very much like this little mini does. 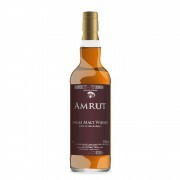 Amrut Fusion is a nice whisky, but I prefer all of the various Cask Strength expressions which Amrut makes to this 50% ABV expression. Thanks again, @Nock! Amrut Fusion was my first introduction to this distillery. The only time I have tried something with a lower ABV was at the SOT tasting in Toronto last year. Nothing by them has failed to impress me. I have a couple of Fusion minis unless I gave one away. You can get them sometimes in Calgary. Do you know what batch yours was? If they are the same batch I might open one to compare impressions, especially as I strive to discover which of the flavours I'm tasting is the one that is "malty". OK, @Nozinan. My mini bottle says "B No 7" and next line, "Aug 2010". Got to say, this little Amrut Fusion mini tin is adorably cute. It certainly is. That's a lot of trouble for a mini. I've seen cannisters on other minis though, like Springbank 15. Sadly, My minis appear to be B 22 March 2013. So no direct comparison. I'll live. I'll probably crack my full size bottle before I open a mini. 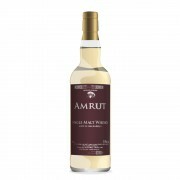 @BigJoe, Amrut is a first-rate brand. With the exception of that one bottle of @dbk's Fusion, every single experience of, maybe 14 total experiences I've had with Amrut, has been a very positive one. The Intermediate Sherry Matured and Portonova releases in particular, and their Cask Strength releases in general, have been excellent. I do not mean to demean Amrut Fusion, but I merely to point out that I have seen more batch and quality variation in this one than in the other Amruts. 89 points is a high score in my book, indicating a very high quality whisky. Thanks for the review @Victor! I am glad to read it, and I am grateful that you gave it a fair examination. I think your experience accurately reflects my own. I have now had 3 of these minis in the past with one more left for a future tasting. I found it extremely hard to really come to grips with this batch on my first taste. By the 3rd I really found myself enjoying it. I am looking forward to picking up a full bottle soon (along with Portonova, and Intermediate Sherry).